If you’re a business owner looking to attract consumers who get excited by great deals, the Route 9 Shopper is for you. 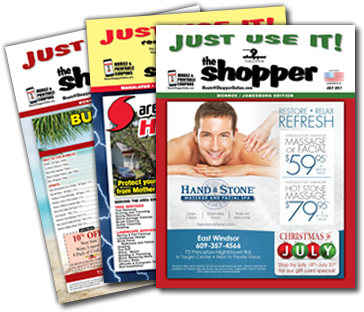 We have featured a wide array of products and services at substantial savings to the 230,000 consumers who have continued to read our magazine month after month over the last 28 years. Are you the kind of person who values a great deal? Do you especially value deals that you can take advantage of again and again … month after month. Do you live in the Monmouth or Ocean County area? If your answers to these questions are “yes”, you need to learn more about the Route 9 Shopper. Are you looking for a good deal at a great restaurant? Do you like to pamper yourself occasionally with a visit to the hair or nail salon? Is it time for a new outfit or a new pair of shoes? Need someone to clean your home? Or perhaps you want to shop for some furniture for the new baby? Looking for a confident smile or healthier lifestyle? Or maybe you’d just like a tan during the winter months? What about that home improvement project whose time has come? Thinking about granite countertops for your kitchen? Or maybe a greener lawn that will last through a hot summer? What about a pool to help you cool off on that hot summer day? Perhaps you’re looking for someone to cater your pool party, or some tables and chairs you can rent? How about buying some outdoor furniture to sit by the pool? Have you ever needed to find an elder law attorney for your parents, or an SAT Prep Tutor for your high school student, or dance lessons for your little one, or for you and your spouse? Need a dentist, an optometrist, or a chiropractor? How about an insurance professional, a tax advisor, or an investment advisor? Are you the kind of person who likes to see, touch, or try on what you’re buying before you make the purchase? Our local businesses are always ready to serve you. And regardless of what you need or want, it is likely there are local businesses that can help you purchase it. Let’s face it … you know you love to buy. You just don’t like to be sold. Our local business owners and their teams know that, and are there to professionally help you buy whatever you need or want. If you’re a consumer looking to buy something, the Route 9 Shopper is the place to go to find the help you’re looking for. If you’re a business looking to sell something, the Route 9 Shopper is the best place to go to showcase what you offer.